In 1993 it was über-curator Hans Ulrich Obrist, who arranged an unannounced exhibition with 70 artists in his modest 12 square meter hotel room in Paris. "Hotel Carlton Palace. Chambre 763" included works by Ed Ruscha, Maurizio Cattelan, Hans-Peter Feldmann, Gilbert & George, Isa Genzken, Sarah Lucas, Gerhard Richter and many others. At the latest since then, the hotel room extended its career from a popular motif for artists and into an alternative exhibition format. Often realised as one-day-shows, a recent hotel-exhibit and opening was curated by Tobias Czudej aka. Chewday's in March 2013. 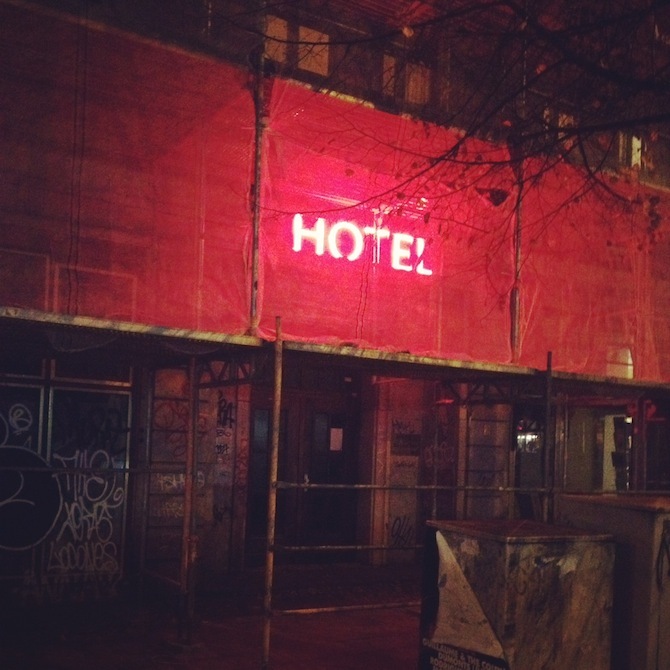 Titled "Ivan's Ecstasy", the site-specific installation included works by Bryan Dooley, Ed Fornieles and Alistair Frost in a London hotel, evoking the aesthetics of a cinematic scene of crime, in which a large blood stain in the middle of the bed was juxtaposed to paintings and objects that merged into the architecture. 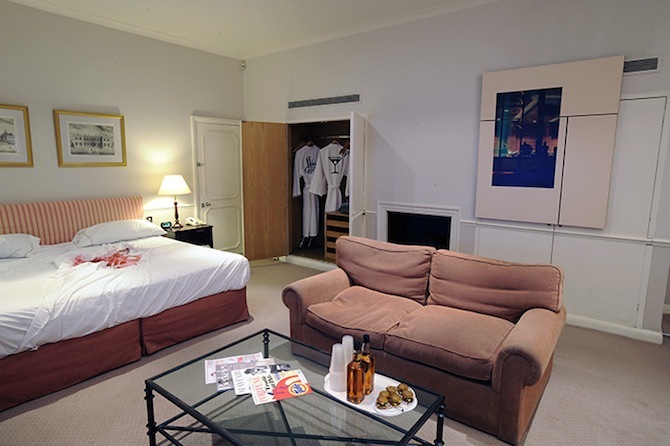 A show that incorporated all available hotel rooms was organised during a weekend in November 2013 by Cologne-based gallery Wahrhus Rittershaus. While looking for a new permanent gallery space, their project Hotel-International included eight international galleries, who were each invited to present one artist in a hotel room. 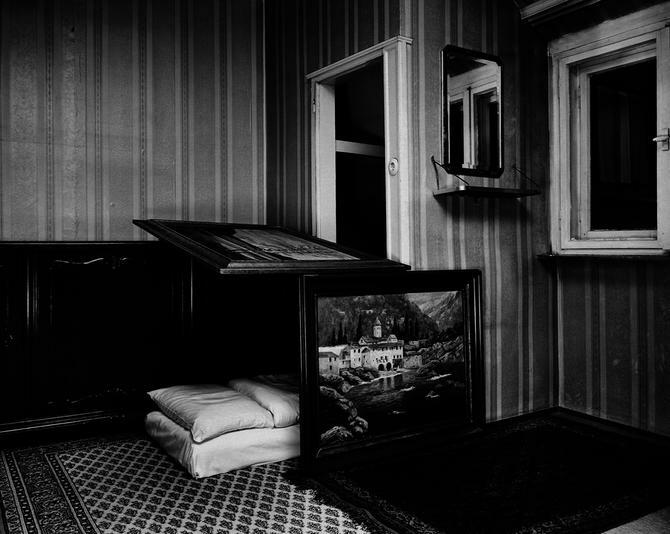 "Room Service", a museum-show at Kunsthalle Baden-Baden (until 22.6.14), currently highlights the relation between art and hotels in a large exhibition and tries to offer an overview on how artists have engaged in the myth of hotels in the past and today. It includes both the historic paintings, such as by Georg Grosz, William Turner and August Sander, and contemporary positions, such as photographs by William Egglestone, Candida Höfer or Hans-Peter Feldmann, paintings by Jenny Brillhart, Ian Wallace or Eberhart Havekost, the renown drawings on hotel-letter-paper by Martin Kippenberger, documentations on his hotel-room interventions by Florian Slotawa and a detective story by Sophie Calle, who pretended that she was a chambermaid. On top of that, they arranged site-specific exhibitions and performances in several hotels from the surrounding area and additionally invited Obrist to re-stage his 1993-hotel-show. The extension of the show into 'events' inside local hotel rooms is, however, a problematic move: Why should a museum organise exhibition-concepts in hotels, when they already have a large and traditionally installed show in their own space? While the phenomenon of a hotel indeed serves as a rich subject to discuss in the arts, the museum show naturally omits the most important feature of a hotel acting as an exhibition space: its exceptional and somewhat peculiar status as a provisional solution – a perforce substitute for an institutional exhibition space, an intervention, characterised by its imperfection and its borrowed in-situ environment. Used as a space for art, the hotel contradicts the museum in every sense, because it implies an unfinishedness, a temporary and process-related exhibition format, and thus an institutional critique. Florian Slotawa "Pension Josefine, München, Zimmer 18, Nacht zum 5. Juli 1999", Baryth-Print, © VG Bild-Kunst Bonn 2014, Courtesy Galerie Nordenhake, Berlin/ Stockholm; Sies + Höke Galerie, Düsseldorf. 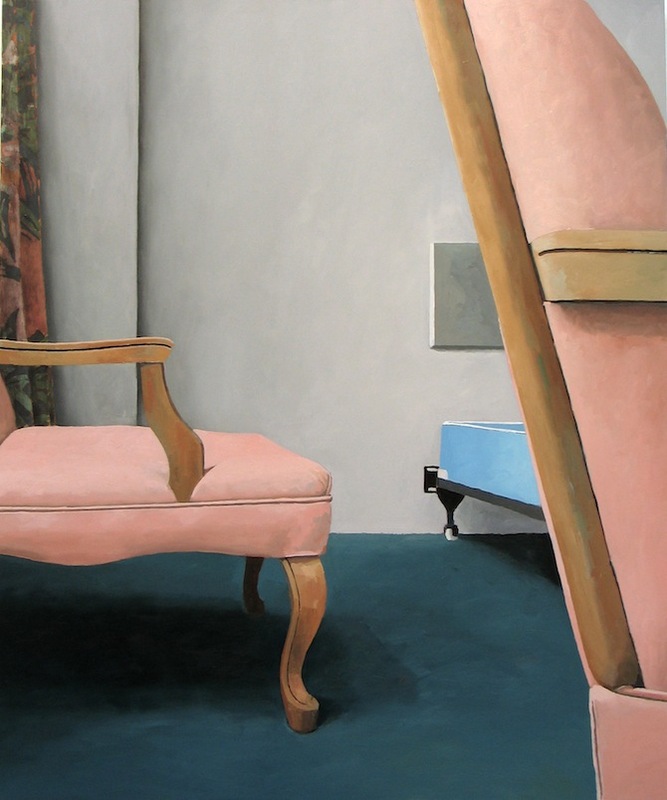 Jenny Brillhart "Saxony Hotel – Interior 3 (Blue Box Spring and Two Pink Chairs)", 2006, Oil on wood, Privatsammlung, © J. Brillhart, Courtesy Galerie Kuckei + Kuckei, Berlin. 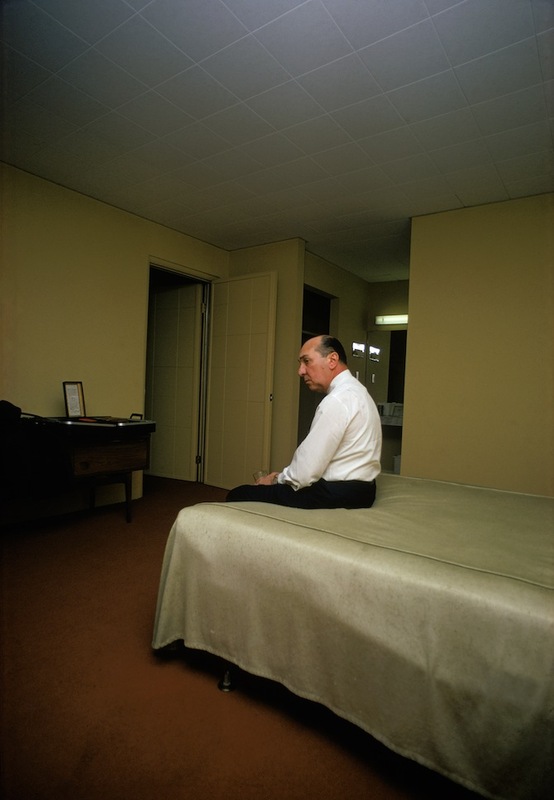 William Eggleston "Untitled (Huntsville, Alabama)", 1969/1970, Dye-transfer-print, © Eggleston Artistic Trust, Courtesy Cheim & Read, New York / Sammlung Museum Folkwang, Essen.